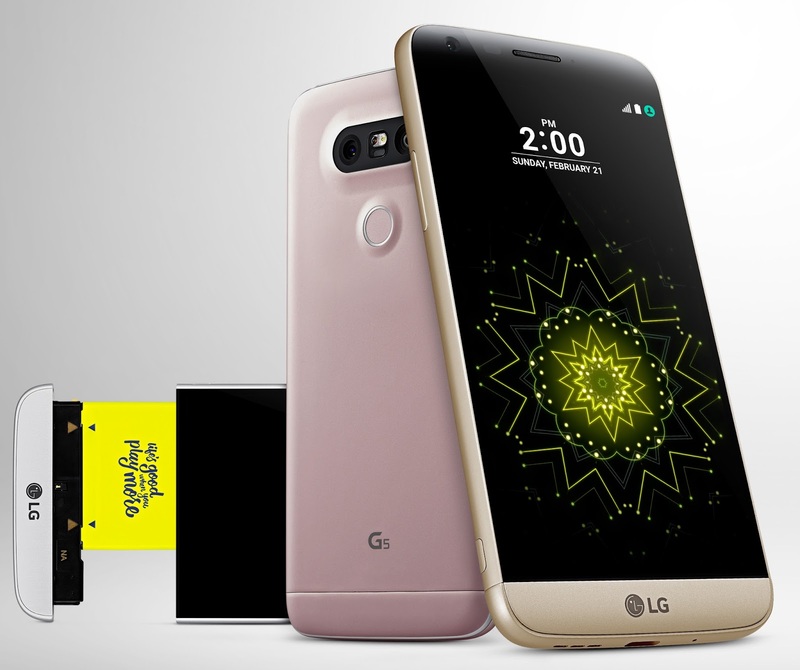 LG Electronics (LG) unveiled its highly anticipated LG G5 smartphone in South Africa. A brand new design with not only a sleek, metal unibody featuring a Slide-out battery but also a Modular Type design that gives a greater smartphone experience. Complete with LG Friends, a collection of companion devices, the G5 can be transformed into a digital camera, Hi-Fi player and more. Encased in a sleek metal aluminium body and slide-out battery to easily swap out a depleted battery for a fully charged one in seconds, the LG G5 surpasses the visual experience of its predecessor, the LG G4. First, the G5’s 135-degree wide angle lens lets you choose between a standard or wide angle lens to get more in the shot. Second, the Always-on Display makes notifications just a glance away with the time, date and more available anytime without waking the G5. Third, the 3D Arc Glass featured in the smartphone’s 5.3-inch display creates a gentle curve and a smooth colourful metal surface through an advanced micronizing pro-cess which takes anodized aluminium to a whole new level. Furthermore, the insulated antenna is invisibly integrated into the body without disrupting the seamless look of the metal unibody. LG designers took the metal body concept one step further by adding a Shiny Cut edge for added contrast and a more comfortable grip. 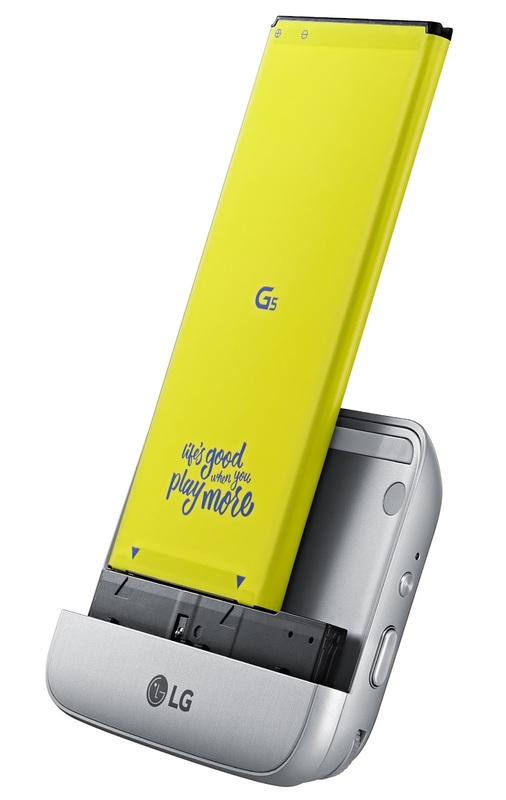 LG’s innovative Modular Type design gives the LG G5 the ability to transform into a digital camera, Hi-Fi player and more all while keeping its traditional removable battery in a full metal unibody design for the first time ever. The LG Hi-Fi Plus with B/O PLAY is an innovative portable Hi-Fi DAC audio player developed in collaboration with B/O PLAY to meet the needs of those who seek to enjoy top-notch sounds that have traditionally only been available through high-end audio devices. LG Hi-Fi Plus with B/O PLAY stands out for its simple yet elegant Scandinavian design as well as premium sound technology. In addition to the 32-bit Hi-Fi DAC up sampling technology first introduced on the LG V10, LG Hi-Fi Plus with B/O PLAY also supports 32-bit 384KHz high-definition audio playback. 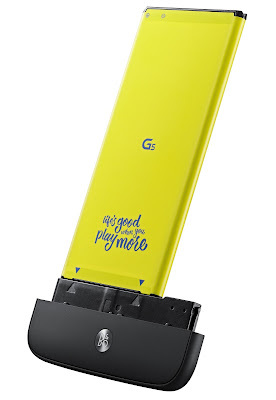 LG Hi-Fi Plus with B/O PLAY can be used either as a module with the LG G5 or as a separate Hi-Fi DAC by connecting to any smartphone or PC. Another advanced display feature in the LG G5 is Daylight Mode, which gives the G5 exceptional outdoor visibility beyond that of current auto brightness technology. Day-light Mode detects surrounding light conditions and instantaneously increases or decreases the brightness of the display, up to 850 nits. Even before your eyes have adjusted to the different lighting conditions, the G5 will be ready. The LG G5 is equipped with the powerful yet energy-efficient Snapdragon 820 processor which offers advanced features such as 64-bit performance, Adreno 530 graphics and lower-power Qualcomm® HexagonTM DSP as well as Qualcomm Spectra™ 14-bit dual image signal processors (ISPs) designed to deliver high resolution DSLR-quality images and additional power savings. The Snapdragon 820 processor also has an inte-grated X12 LTE modem that supports Category 12 download speeds of up to 600 Mbps and LTE Category 13 uplink speeds of up to 150 Mbps. Compared to the previous generation Snapdragon processor, Qualcomm Technologies’ most advanced CPU architecture offers double the speed and power savings. Adreno 530 graphics demonstrate up to 40 percent faster graphics performance and up to 40 percent more power efficiency compared to the previous generation. The Snapdragon 820 processor also supports 4K capture and playback at four times more than the resolution of 1080p, enabling users to watch and capture their daily moments in stunning de-tail and clarity. The processor is also optimized for VR, generating quality pixels and life-like colours to deliver the ultimate VR experience to G5 users. I am looking forward to review the device as well as accessories that are launched with the phone.